HomeBlogWhen do Millennials Plan to Buy Their First Home? Buying a home is a big step during adulthood. Home-owning takes being employed with a steady income, and in terms of the mortgage, no fear of a long term commitment. It makes sense that people want to wait until the perfect time, or until they find the perfect house, before they sign on the dotted line. For Millennials especially, growing up during the housing crisis and recession have shaped their outlook on the future of homeownership. While there have been many reports on the decline of Millennials owning property, we sought out ask them when exactly they see themselves buying their first home. Note: The Millennial age range includes 18-34 years of age, so while these are still young homeowners, an 18 year old will typically have different homeownership aspirations compared to a 34 year old. In certain instances of our survey breakdown, we compared the two groups (18-24 vs. 25-34) to see if there were dramatic differences in their homeownership goals. 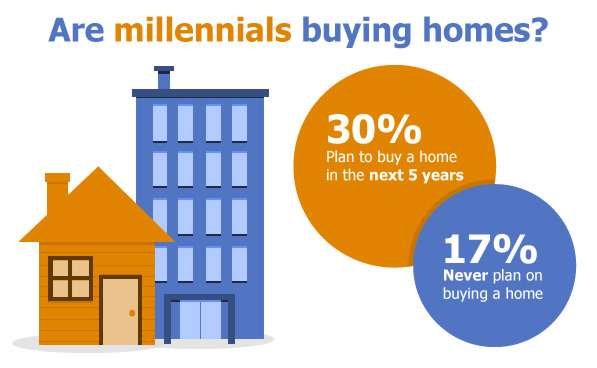 For Millennials seeking a home, 30% plan to purchase one within the next 5 years—a high level of confidence given the reports that Millennial homeownership is down. The next time frame, 6-10 years, showed the biggest discrepancy within the age group. 25% of 18-24 year olds said they would buy a home within this time frame, but only 10% of 25-34 year olds said the same. This could show that 25-34 year olds aren’t planning for homeownership long term if they are still renting. As a whole, 17% of Millennials said they never plan on buying a home—showing that economic factors have impacted a small set of Millennials to remain lifelong renters. It seems that owning a home sounds much more unappealing to men than women. Overall, only 15% of Millennial women said they plan on never buying a home, whereas 19% of males gave that response. When looking at the Millennial age range most likely to own a home (25-34), 41% of women were already homeowners, compared to only 36% of men in the same age range. Finally, women continue to be more likely to plan for homeownership in the future, with almost twice as many Millennial women planning to buy a home within the next 6-10 years compared to men. There were some notable differences in household income, primarily those who are planning on buying a home within the next five years. Close to 40% of Millennials making less than $24,000 a year said they plan on buying a home in the next five years. Additionally, only 25% of those making between $50-74,000 said they have the same plans. Given these same salary parameters however, only 14% of those making less than $24,000 said they already own a home, while close to 33% of those making $50-74,000 said they already own one—showing that while Millennials are aspirational, their homeownership goals don’t always come to fruition. The Choice Home Warranty survey asked respondents aged 18-34 “When do you plan to buy your first home?” using the Google Consumer Surveys tool. The survey ran in January 2015 and gathered 1,002 responses. Results are weighted by inferred gender and region to reflect the population.